Green Energy Cooperative (ZEZ) organized the first pilot audit in Croatia within the project Biomasud Plus from the program Horizon 2020. The overall goal of the project Biomasud Plus is to develop the market of mediterranean solid biofuels with implementing the label of quality and sustainability BIOmasud® for at least two companies producing and /or distributing residential heating solid biofuels within Mediterranean countries. 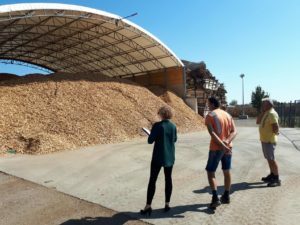 After months of searching for and contacting companies who are potential candidates and willing to do the audit, Green Energy Cooperative managed to select two companies for the pilot audits.The first company is Hamar Promet Ltd., a producer of wood chips from Velika Gorica, the city near Zagreb and the second company is Forest Ltd., also a producer of wood chips, from Jastrebarsko, also near Zagreb. Hammar Ltd. produces around 12 000 tons of wood chips per year, and Forest Ltd. around 4 000 tons per year. The end users are local schools and kindergartens (small installation less than 400 kW) in both cases. The scope of the pilot audits was to check whether wood chips could comply with the quality requirements of the BIOmasud® Handbook. To get the certificate, a company must accomplish three conditions: quality, sustainability and traceability of biomass. The pilot audit at Hamar took place on September 18th and the pilot audit at Forest took place on October 5th by TÜV Croatia (listed BIOmasud inspection & certification body) During the audit, an inspector checked the internal documentation, sustainability and traceability criteria and collected wood chips samples (around 30 kg) that were sent to the laboratory Bios Bio-Energie System (Austria) for further analysis. During the audits it has been discovered that these companies don’t have self-inspection and for obtaining the label of BIOmasud®, the producer should establish the self inspection to make sure all series of production are of the same quality and in accordance with standards of BIOmasud® certification system.